Update – sorry, all sold. 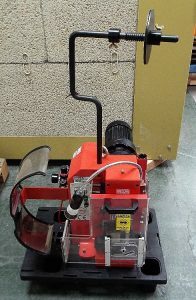 One off Molex TM3000 Universal Press, Complete With Fineadjust Applicators. Available singly or as an entire, ready to work, system. Being sold by online timed auction through Bidspotter, the auction closes on 24 May, starting 3pm. Viewing recommended, the system is located in the Midlands. Viewing day 23 May. To arrange to view, first register with Bidspotter to bid in the auction, then email paul@assetdisposalservices.co.uk to ask to view. To go to our online brochure – CLICK HERE. To go to the auction directly – CLICK HERE. 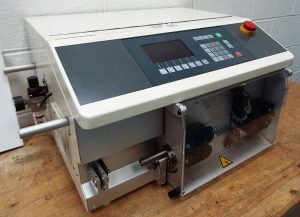 The PreFeeder 2200 is a free-standing, electric-demand prefeeding machine designed to pull wire and cable from reels weighing up to 70 kg (154 lbs) and provide a constant tension to downstream wire processing machines. A moveable dancer pulley allows the PreFeeder 2200 to easily respond to the typical intermittent starting and stopping actions associated with automatic wire processing machines. Designed to apply a wide range of side-feed and rear-feed terminals to a pre-stripped discrete wire or cable. Suited to mid-volume semi-automatic operations. Production flexibility is obtained using interchangeable FineAdjust or Mini-Mac applicators and most Industry Standard Applicators. 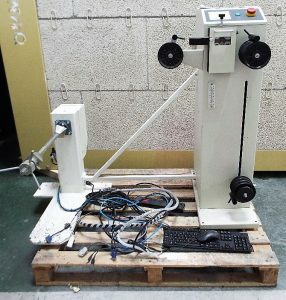 These presses will complete one crimping cycle with each depression of the foot pedal (also available with the lot) and two depressions for split cycle. Safe operation is provided by an interlock switch that renders the press inoperative if the safety guard is opened or removed. These presses also have a secondary interlock switch in the back of the motor where the hand cycle wrench is used to prevent the foot switch from cycling during hand cycling operations or if the hand cycle wrench is accidentally left in the motor. This lot features a preloaded Molex Fineadjust Applicator in the existing press, the foot-pedal needed to make the unit operational and a further two Fineadjust applicators and comprehensive OEMs technical manuals and operating instructions.